"Sein und Zeit" redirects here. For the episode of The X-Files, see Sein und Zeit (The X-Files). Being and Time (German: Sein und Zeit) is a 1927 book by the German philosopher Martin Heidegger, in which Heidegger seeks to analyse the concept of Being. This has fundamental importance for philosophy, he thought, because since the time of the Ancient Greeks, philosophy has avoided this question, turning instead to the analysis of particular beings. Heidegger seeks a more fundamental ontology through understanding being itself. He approaches this through seeking understanding of beings to whom the question of being is important, i.e. 'Dasein', or the human being in the abstract. Although written quickly, and though Heidegger did not complete the project outlined in the introduction, Being and Time remains his most important work. Being and Time has profoundly influenced 20th-century philosophy, particularly existentialism, hermeneutics, deconstruction, and the enactivist approach to cognition. The book is dedicated to Edmund Husserl "in friendship and admiration". According to Heidegger's statement in Being and Time, the work was made possible by his study of Husserl's Logical Investigations (1900-1901). Marxist philosopher Lucien Goldmann argues in his posthumously published Lukacs and Heidegger: Towards a New Philosophy (1973) that the concept of reification as employed in Being and Time showed the strong influence of György Lukács' History and Class Consciousness (1923). Heidegger never mentions Lukács in his writing, however, and Laurence Paul Hemming, writing in Heidegger and Marx (2013), finds the suggestion that Lukács influenced Heidegger to be highly unlikely at best. Being and Time was originally intended to consist of two major parts, each part consisting of three divisions. Heidegger was forced to prepare the book for publication when he had completed only the first two divisions of part one. The remaining divisions planned for Being and Time (particularly the divisions on time and being, Immanuel Kant, and Aristotle) were never published, although in many respects they were addressed in one form or another in Heidegger's other works. In terms of structure, Being and Time remains as it was when it first appeared in print; it consists of the lengthy two-part introduction, followed by Division One, the "Preparatory Fundamental Analysis of Dasein," and Division Two, "Dasein and Temporality." Heidegger describes his project in the following way: "our aim in the following treatise is to work out the question of the sense of being and to do so concretely." Heidegger claims that traditional ontology has prejudicially overlooked this question, dismissing it as overly general, undefinable, or obvious. Instead Heidegger proposes to understand being itself, as distinguished from any specific entities (beings). "'Being' is not something like a being." Being, Heidegger claims, is "what determines beings as beings, that in terms of which beings are already understood." Heidegger is seeking to identify the criteria or conditions by which any specific entity can show up at all (see world disclosure). If we grasp Being, we will clarify the meaning of being, or "sense" of being ("Sinn des Seins"), where by "sense" Heidegger means that "in terms of which something becomes intelligible as something." According to Heidegger, as this sense of being precedes any notions of how or in what manner any particular being or beings exist, it is pre-conceptual, non-propositional, and hence pre-scientific. Thus, in Heidegger's view, fundamental ontology would be an explanation of the understanding preceding any other way of knowing, such as the use of logic, theory, specific ontology or act of reflective thought. At the same time, there is no access to being other than via beings themselves—hence pursuing the question of being inevitably means asking about a being with regard to its being. Heidegger argues that a true understanding of being (Seinsverständnis) can only proceed by referring to particular beings, and that the best method of pursuing being must inevitably, he says, involve a kind of hermeneutic circle, that is (as he explains in his critique of prior work in the field of hermeneutics), it must rely upon repetitive yet progressive acts of interpretation. "The methodological sense of phenomenological description is interpretation." Thus the question Heidegger asks in the introduction to Being and Time is: what is the being that will give access to the question of the meaning of Being? Heidegger's answer is that it can only be that being for whom the question of Being is important, the being for whom Being matters. As this answer already indicates, the being for whom Being is a question is not a what, but a who. Heidegger calls this being Dasein (an ordinary German word literally meaning "being-there" i.e. existence), and the method pursued in Being and Time consists in the attempt to delimit the characteristics of Dasein, in order thereby to approach the meaning of Being itself through an interpretation of the temporality of Dasein. Dasein is not "man," but is nothing other than "man"—it is this distinction that enables Heidegger to claim that Being and Time is something other than philosophical anthropology. Heidegger's account of Dasein passes through a dissection of the experiences of Angst and mortality, and then through an analysis of the structure of "care" as such. From there he raises the problem of "authenticity," that is, the potentiality or otherwise for mortal Dasein to exist fully enough that it might actually understand being. Heidegger is clear throughout the book that nothing makes certain that Dasein is capable of this understanding. Finally, this question of the authenticity of individual Dasein cannot be separated from the "historicality" of Dasein. On the one hand, Dasein, as mortal, is "stretched along" between birth and death, and thrown into its world, that is, thrown into its possibilities, possibilities which Dasein is charged with the task of assuming. On the other hand, Dasein's access to this world and these possibilities is always via a history and a tradition—this is the question of "world historicality," and among its consequences is Heidegger's argument that Dasein's potential for authenticity lies in the possibility of choosing a "hero." Although Heidegger describes his method in Being and Time as phenomenological, the question of its relation to the phenomenology of Husserl is complex. The fact that Heidegger believes that ontology includes an irreducible hermeneutic (interpretative) aspect, for example, might be thought to run counter to Husserl's claim that phenomenological description is capable of a form of scientific positivity. On the other hand, however, several aspects of the approach and method of Being and Time seem to relate more directly to Husserl's work. The central Husserlian concept of the directedness of all thought—intentionality—for example, while scarcely mentioned in Being and Time, has been identified by some with Heidegger's central notion of Sorge (Cura, care or concern). However, for Heidegger, theoretical knowledge represents only one kind of intentional behaviour, and he asserts that it is grounded in more fundamental modes of behaviour and forms of practical engagement with the surrounding world. Whereas a theoretical understanding of things grasps them according to "presence," for example, this may conceal that our first experience of a being may be in terms of its being "ready-to-hand." Thus, for instance, when someone reaches for a tool such as a hammer, their understanding of what a hammer is is not determined by a theoretical understanding of its presence, but by the fact that it is something we need at the moment we wish to do hammering. Only a later understanding might come to contemplate a hammer as an object. The total understanding of being results from an explication of the implicit knowledge of being that inheres in Dasein. Philosophy thus becomes a form of interpretation, but since there is no external reference point outside being from which to begin this interpretation, the question becomes to know in which way to proceed with this interpretation. This is the problem of the "hermeneutic circle," and the necessity for the interpretation of the meaning of being to proceed in stages: this is why Heidegger's technique in Being and Time is sometimes referred to as hermeneutical phenomenology. As part of his ontological project, Heidegger undertakes a reinterpretation of previous Western philosophy. He wants to explain why and how theoretical knowledge came to seem like the most fundamental relation to being. This explanation takes the form of a destructuring (Destruktion) of the philosophical tradition, an interpretative strategy that reveals the fundamental experience of being at the base of previous philosophies that had become entrenched and hidden within the theoretical attitude of the metaphysics of presence. This use of the word Destruktion is meant to signify not a negative operation but rather a positive transformation or recovery. In Being and Time Heidegger briefly undertakes a destructuring of the philosophy of René Descartes, but the second volume, which was intended to be a Destruktion of Western philosophy in all its stages, was never written. In later works Heidegger uses this approach to interpret the philosophies of Aristotle, Kant, Georg Wilhelm Friedrich Hegel, and Plato, among others. The publication in 1992 of the early lecture course, Platon: Sophistes (Plato's Sophist, 1924), made clear the way in which Heidegger's reading of Aristotle's Nicomachean Ethics was crucial to the formulation of the thought expressed in Being and Time. The lecture course, Prolegomena zur Geschichte des Zeitbegriffs (History of the Concept of Time: Prolegomena, 1925), was something like an early version of Being and Time. The lecture courses immediately following the publication of Being and Time, such as Die Grundprobleme der Phänomenologie (The Basic Problems of Phenomenology, 1927), and Kant und das Problem der Metaphysik (Kant and the Problem of Metaphysics, 1929), elaborated some elements of the destruction of metaphysics which Heidegger intended to pursue in the unwritten second part of Being and Time. Heidegger's inaugural lecture upon his return to Freiburg, "Was ist Metaphysik?" ("What Is Metaphysics? ", 1929), was an important and influential clarification of what Heidegger meant by being, non-being, and nothingness. Einführung in die Metaphysik (An Introduction to Metaphysics), a lecture course delivered in 1935, is identified by Heidegger, in his preface to the seventh German edition of Being and Time, as relevant to the concerns which the second half of the book would have addressed. Beiträge zur Philosophie (Vom Ereignis) (Contributions to Philosophy [From Enowning], composed 1936–38, published 1989), a sustained attempt at reckoning with the legacy of Being and Time. Zeit und Sein ("Time and Being"), a lecture delivered at the University of Freiburg on January 31, 1962. This was Heidegger's most direct confrontation with Being and Time. It was followed by a seminar on the lecture, which took place at Todtnauberg on September 11–13, 1962, a summary of which was written by Alfred Guzzoni. Both the lecture and the summary of the seminar are included in Zur Sache des Denkens (1969; translated as On Time and Being [New York: Harper & Row, 1972]). Being and Time is, according to philosopher Helmut R. Wagner, the "most influential version of existential philosophy." The work influenced many philosophers and writers, among them Hannah Arendt, Leo Strauss, Alexandre Kojève, Hans-Georg Gadamer, Giorgio Agamben, Jean-Paul Sartre, Emmanuel Levinas, Maurice Merleau-Ponty, Alain Badiou, Herbert Marcuse, Jacques Derrida, Michel Foucault and Bernard Stiegler. Most notable among the philosophical works influenced by Being and Time are Jean-Paul Sartre's Being and Nothingness (1943), Hans-Georg Gadamer's Truth and Method (1960), Emmanuel Levinas' Totality and Infinity (1961), Gilles Deleuze's Difference and Repetition (1968), Alain Badiou's Being and Event (1988), and Bernard Stiegler's Technics and Time, 1 (1994). George Steiner describes Sartre's existentialism as "a version and variant of the idiom and propositions" in Being and Time. Maurice Merleau-Ponty writes in Phenomenology of Perception (1945) that, "the whole of Sein und Zeit springs from an indication given by Husserl and amounts to no more than an explicit account of the 'natürlicher Weltbegriff' or the 'Lebenswelt' which Husserl, towards the end of his life, identified as the central theme of phenomenology". Heidegger influenced psychoanalysis through Jacques Lacan, whose Rome Discourse generally links together the subject, language, and speech on a basis of a reading of psychoanalysis that is undeniably hermeneutical phenomenological, a methodology first introduced in Being and Time. A decade later Lacan would criticize that method in Seminar XI where he sought to 'radically suspend Heidegger's question of the meaning of being'—a question Heidegger explicitly raises on the first page of Being and Time and one which forms the exploratory basis of his book. Stephen Houlgate compares Heidegger's achievements in Being and Time to those of Kant in the Critique of Pure Reason (1781) and Hegel in the The Phenomenology of Spirit (1807) and Science of Logic (1812-1816). Simon Critchley calls Being and Time Heidegger's magnum opus, and writes that it is impossible to understand developments in continental philosophy after Heidegger without understanding the work. According to Critchley, while the work is difficult for many reasons, Heidegger's basic idea "is extremely simple: being is time. That is, what it means for a human being to be is to exist temporally in the stretch between birth and death. Being is time and time is finite, it comes to an end with our death. Therefore, if we want to understand what it means to be an authentic human being, then it is essential that we constantly project our lives onto the horizon of our death, what Heidegger calls 'being-towards-death'. Heidegger has become common background for the political movement concerned with protection of the environment, and his narrative of the history of Being frequently appear when capitalism, consumerism and technology are thoughtfully opposed. Michael E. Zimmerman writes that, "Because he criticized technological modernity’s domineering attitude toward nature, and because he envisioned a postmodern era in which people would “let things be,” Heidegger has sometimes been read as an intellectual forerunner of today’s “deep ecology” movement. ↑ Rouse (ed. ), Joseph (2013). John Haugeland, Dasein Disclosed: John Haugeland's Heidegger. US: Harvard University Press. ISBN 9780674072114. Retrieved 29 September 2016. ↑ Ward, Dave & Stapleton, Mog (2012). Es are good. Cognition as enacted, embodied, embedded, affective and extended. In Fabio Paglieri (ed. ), Consciousness in Interaction: The role of the natural and social context in shaping consciousness. ↑ Stendera, Marilyn (2015). Being-in-the-world, Temporality and Autopoiesis. _Parrhesia: A Journal of Critical Philosophy_ 24:261-284. ↑ Heidegger, Martin (2008). Being and Time. New York: HarperPerennial. p. 62. ISBN 978-0-06-157559-4. ↑ Hemming, Laurence Paul (2013). Heidegger and Marx: A Productive Dialogue Over the Language of Humanism. Evanston, Illinois: Northwestern University Press. pp. 33–4. ISBN 978-0-8101-2875-0. ↑ Sein und Zeit, pp. 39–40. ↑ "Die konkrete Ausarbeitung der Frage nach dem Sinn von “Sein” ist die Absicht der folgenden Abhandlung." Sein und Zeit, p. 1. ↑ Sein und Zeit, pp. 2–4. ↑ In other words, being is distinguished from beings such as physical objects or even, as Heidegger explains in his discussion of the "worldhood of the World," that entire collection of things that constitutes the physical universe. To preserve Heidegger's distinction, translators usually render "Sein" as "being", the gerund of "to be", and "Seiend" (singular) and "Seiendes" (plural) as the verb-derived noun "a being" and "beings," and occasionally, perhaps preferably, as "an entity" and "entities"." ↑ "...das Sein, das, was Seiendes als Seiendes bestimmt, das, woraufhin Seiendes, mag es wie immer erörtert werden, je schon verstanden ist,"Sein und Zeit, p. 6. ↑ Sein und Zeit, pp. 8–9. 1 2 Sein und Zeit, p. 12. ↑ Sein und Zeit, p. 7. ↑ "der methodische Sinn der Phänomenologischen Deskription ist Auslegung," Sein und Zeit, p. 37. ↑ Sein und Zeit, p. 437. ↑ Jacobs, D. C., ed., The Presocratics after Heidegger (Albany: State University of New York Press, 1999), p. 129. ↑ Naess Jr., Arne D. "Martin Heidegger's Later philosophy". Encyclopædia Britannica. Retrieved June 28, 2013. ↑ Wagner, Helmut R. (1983). Phenomenology of Consciousness and Sociology of the Life-world: An Introductory Study. Edmonton: The University of Alberta Press. p. 214. ISBN 0-88864-032-3. ↑ Ayer, A. J. (1984). Philosophy in the Twentieth Century. London: Unwin Paperbacks. p. 216. ISBN 0-04-100044-7. ↑ Steiner, George (1991). Martin Heidegger. Chicago: The University of Chicago Press. p. 5. ISBN 0-226-77232-2. ↑ Merleau-Ponty, Maurice (1965). Phenomenology of Perception. London: Routledge & Kegan Paul. p. vii. ↑ Lacan, Jacques (2006) . Fink, Bruce, ed. "The Function and Field of Speech and Language in Psychoanalysis". Ecrits: The First Complete Edition in English. New York: W. W. Norton & Company: 197–268. ↑ Urban, William J. (2015). Lacan and Meaning: Sexuation, Discourse Theory, and Topology in the Age of Hermeneutics. New York. p. 68. ISBN 978-1530345502. ↑ Houlgate, Stephen (1999). The Hegel Reader. Oxford: Blackwell Publishers. p. ix. ISBN 0-631-20347-8. ↑ Critchley, Simon. "Being and Time, part 1: Why Heidegger Matters". The Guardian. Retrieved 26 February 2015. ↑ Michael E. Zimmerman (November 2011). "intellectual forerunner of today's "deep ecology" movement" (PDF). Heidegger and Deep Ecology. University of Colorado Boulder. p. 1. Retrieved May 24, 2015. 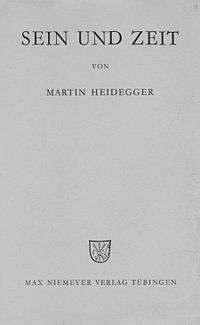 Martin Heidegger, Sein und Zeit, in Heidegger's Gesamtausgabe, volume 2, ed. F.-W. von Herrmann, 1977, XIV, 586p. Martin Heidegger (1962). Being and Time. Translated by John Macquarrie & Edward Robinson. London: SCM Press. Martin Heidegger (1996). Being and Time. A Translation of "Sein und Zeit". Translated by Joan Stambaugh (7th ed.). Albany, New York: SUNY Press. Martin Heidegger (2010). Being and Time. Translated by Joan Stambaugh, revised by Dennis J. Schmidt. Albany, New York: SUNY Press. Robert Bernasconi, "'The Double Concept of Philosophy' and the Place of Ethics in Being and Time," Heidegger in Question: The Art of Existing (New Jersey: Humanities Press, 1993). William D. Blattner, Heidegger's Temporal Idealism (Cambridge: Cambridge University Press, 1999). Richard Capobianco, Engaging Heidegger with a Foreword by William J. Richardson. University of Toronto Press, 2010. Taylor Carman, Heidegger's Analytic: Interpretation, Discourse, and Authenticity in "Being and Time" (Cambridge: Cambridge University Press, 2003). Jacques Derrida, "Ousia and Gramme: Note on a Note from Being and Time," Margins of Philosophy (Chicago: University of Chicago Press, 1982). Hubert Dreyfus, Being-in-the-World: A Commentary on Heidegger's Being and Time, Division I (Cambridge, Massachusetts, & London: MIT Press, 1990). Christopher Fynsk, Heidegger: Thought and Historicity (Ithaca & London: Cornell University Press, 1993, expanded edn. ), ch. 1. Michael Gelven, A Commentary on Heidegger's "Being and Time" (Northern Illinois University Press; Revised edition, 1989). Magda King (2001). John Llewellyn, ed. A guide to Heidegger's "Being and time". Albany, New York: SUNY Press. Theodore Kisiel, The Genesis of Heidegger's Being and Time (Berkeley & Los Angeles: University of California Press, 1993). James Luchte, Heidegger's Early Thought: The Phenomenology of Ecstatic Temporality (London: Bloomsbury Publishing. 2008). William McNeill, The Glance of the Eye: Heidegger, Aristotle, and the Ends of Theory (Albany: State University of New York Press, 1999), ch. 3–4. Jean-Luc Nancy, "The Decision of Existence," The Birth to Presence (Stanford: Stanford University Press, 1993). William J. Richardson (1963). Heidegger. Through Phenomenology to Thought. Preface by Martin Heidegger. The Hague: Martinus Nijhoff Publishers. ; 4th Edition (2003). New York City: Fordham University Press. Richard M. Mcdonough (2006). Martin Heidegger's "Being and Time". Bern: Peter Lang.